This summer, I will finally take the first of my major Great Grand Genealogy Tours (GGGT), as described a year ago. I simply couldn't afford it in 2013. This year, I am in a much better situation. I also have very generous financial support from Dad and Grandpa Fagerland. As I was planning out my Great Grand Genealogy "Tour" last year, I quickly realized that it was too large to do all at once. It would have to be broken into smaller tours over several summers. I already took a mini-GGT last Christmastime, collecting some genealogical photos and documents from the grandparents' generation. This summer, the GGGT of the Western US will cover many more miles and will take two weeks to complete. The trip will begin with a drive up the coast all the way to the Seattle area. I am prioritizing the visit to my great-uncle Orville Fagerland because of his age. Orville, at 98, is the oldest surviving member of my grandparents' generation. He knew some of his grandparents, my 2nd-greats; my grandfather is too young to have known them. Many Fagerland relatives have settled in Washington. 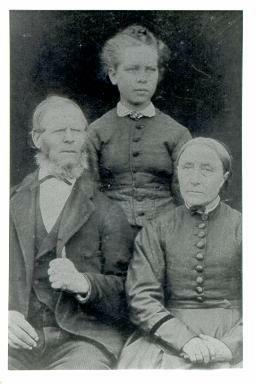 A nearby 2nd cousin claims to have a picture of my 2nd-great-grandparents Ole and Mary Fagerland. If so, this photo would be one of the highlights of my tour. It would complete my collection of photographs of all sixteen 2nd-great-grandparents! of mine donated a collection of documents and / or artifacts from the Svares, descendants of my 3rd-great grandparents Hans and Elisabeth Svare. I am making special arrangements to see the collection. Next is a visit with another Svare cousin in Boise, ID. She has a trunk full of documents and photos that I hope to raid. She may have some information about the source of a legend that we are descended from the King of Sweden / Norway. Next will be a big diversion to Rapid City to spend the 4th of July with family. I've even heard rumors of an unofficial 25th high-school reunion. On the way home, I will visit the Family History Library in Salt Lake City, UT, the largest genealogical collection in the world. I will have free access to professional staff genealogists. I'm bringing questions about some 3rd-great grandparents of mine that I haven't been able to trace. This will include ancestors in the Fagerland, Meyer, and Beck branches. The entire route is plotted above. Sorry, I don't know how to make the legend on the left go away. If you maximize to a full screen, the legend is not too invasive.